Naoto Kan’s days as premier look numbered, says veteran Japan watcher Karel van Wolferen. But who comes next is much less clear. What did you make of the memo agreed between Prime Minister Naoto Kan and Yukio Hatoyama arranging for Kan to step down, once ‘certain actions’ have taken place, in return for support in fending off a no-confidence motion? It was quite clear that if a significant segment of the Democratic Party of Japan had joined the opposition by voting in favour of the no-confidence motion, this would have meant the end of the Kan Cabinet. It would also almost certainly have split the party. 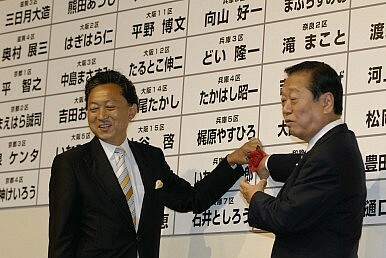 Ichiro Ozawa and Yukio Hatoyama had been virtually excluded by Kan, and their policy input, which had been so important from the founding of the party onward, was as good as being ignored. A dejected Ozawa, who saw the best chance for genuine political reform slipping away, had been contemplating another option for realizing what he had worked for since 1993. His idea was to take those loyal to him – roughly half the DPJ members of parliament – out of the party and seek an alliance with other reformist minded groups, including bits and pieces of the gradually disintegrating Liberal Democratic Party. To save the party for the time being, Kan had to be given an opportunity to give up the prime ministership without too great a loss of face, and without having to suffer the indignity of being ousted by a no-confidence motion. The compromise memo about Kan stepping down after a number of bills related to post-calamity recovery have been passed was an obvious choice for the ruling party politicians who still hope to be able to patch things up, and who wanted to avoid any risk of Kan fighting his way out from under a no-confidence vote by calling for a general election. Pressure seems still to be mounting on Kan to step down. How much longer do you think he can hold on? There’s no question that those party members who have supported the compromise memo will expect him to step down some time in July. Kan would lose even more support from those who had earlier lined up behind him, as the assessment that he wasn’t handling the aftermath of the earthquake and tsunami well enough has become pretty widespread throughout party ranks. Who do you think is likely to succeed him? As far as I know, the succession is up in the air. And it’s a difficult issue. Very much unlike changes from one prime minister to another when the LDP was in charge, the person who forms a DPJ cabinet is expected to come up with genuine policy adjustments, and to try to implement those. What the first DPJ cabinet under Hatoyama (with Ozawa very much behind it) was trying to do, in line with the original party thinking and policy programmes, was being sabotaged by several groups of career officials in various ministries. Important also was that Washington reacted strongly to the intentions of the new government to work towards a more independent Japan, which could at the least take initiatives for better relations with China and greater involvement in regional East Asia projects. Hatoyama was brought down by the machinations that followed. Kan, making sure that this wouldn’t happen to him, adopted a much more servile attitude toward the United States, a stance that if continued, would undoubtedly have long-term repercussions.